This simple guide to Beginner Meditation will help you add mindfulness to your daily routine. So far we’ve had some amazing recipe guest posts but I thought it’d be fun to change things up a bit and make sure we’re not only keeping our bellies happy, but our minds too! So, I recruited Emily – yep, you guessed it…another fellow RD!…to talk to you guys about beginner meditation and mindfulness and how you can bring them into your life! Emily blogs over at Zen and Spice where she shares delicious recipes of her own, along with posts that cover other important aspects of nutrition and health. Go check it out! Hey everyone! My name is Emily, and I’m a Registered Dietitian from Dallas, Texas. I blog over at Zen & Spice, a health & wellness blog where I share my favorite recipes, workouts, meditation and mindfulness tips. I’m really excited that Lindsay has invited me here today – thank you so much for having me! Today I wanted to talk a little bit about mindfulness and meditation. These two practices are so important to help you feel less anxious and more relaxed about life! Mindfulness is the state of taking things moment-by-moment. It’s an active, open awareness of the present. When you’re mindful, you are observing your thoughts, feelings, sensations and surrounding environment from afar, without judgment. Mindfulness focuses the brain on what is being sensed at each moment, instead of ruminating on the past or future. This lets you see every current moment and appreciate them. Living in the present and not obsessing over the future or past is very important. Appreciate who you are right now and find joy in your current state. Starting a daily meditation practice can be very helpful in bringing us into the moment. Meditation is not a religion-specific practice. Anyone from any religious background who wants to learn how to center themselves and become more mindful can meditate! There are three basic types of meditation. I like to use the sitting meditation the most (I tend to fall asleep if I lay down!). Sitting meditation: Sit in a comfortable position with your back upright. Don’t slouch. Cross your legs, and let your hands fall into your lap. Inhale deeply and exhale. Close your eyes. There are many options here—the two most popular breath counting (count from 1-10, keep your mind clear), or breathing with a mantra (“Here, now”, or my favorite, “I am strong, I am healthy”). Laying down meditation: Relax on your couch or in your bed in a comfortable position. Relax all of your muscles and release any tension you may have in your neck, back, arms or legs. Imagine your favorite spot in nature, and take deep breaths in and out. 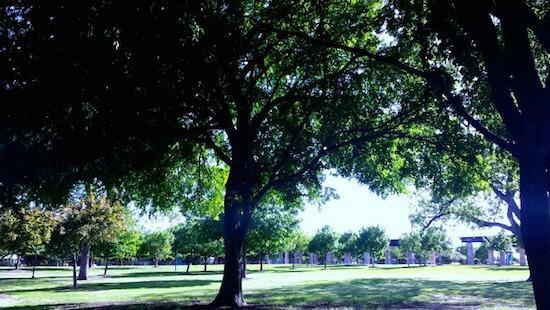 Try to keep your mind empty by imagining the sun, the wind, the green grass, etc. Walking meditation: You can either go for a walk outside, or you can just walk through your home. Take a breath at each step, one in and one out, and repeat a mantra such as “I am home”, or “Here, now”. Helpful tip: If you’re having trouble keeping your mind clear, imagine you’re leaning up against the wall of a train station. Trains are your thoughts. They’re coming into the station, slowing down, but then continue right through the other end. You are aware of the trains, you can feel them, but you don’t have to pay attention to them. Meditation can be such a good way to start your day, deal with stress, and live in the present moment. It’s a very simple practice. Don’t stress about learning how or becoming good at it—that’s the thing meditation is trying to teach you to avoid! Do this every day, and after a while you’ll have formed a great habit. 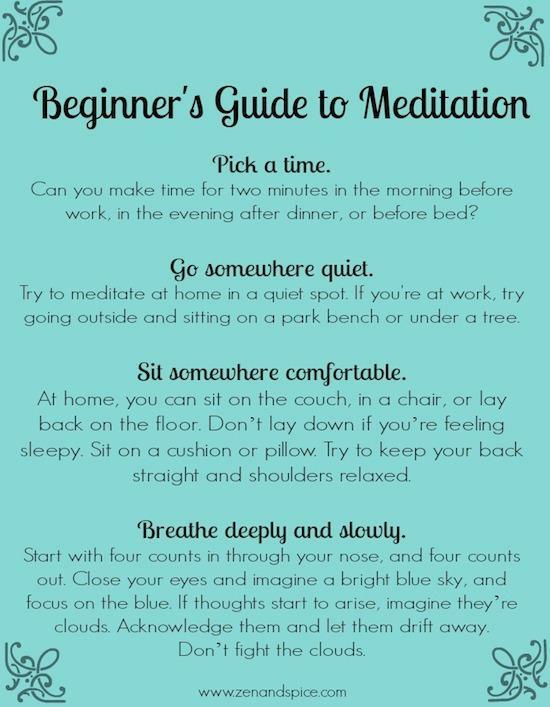 Looking to start meditating? Here are some beginner tips from @zenandspice and @Leangrnbeanblog! Do you meditate? If not, did this convince you to start?! Great tips and something I truly could use right now. Thanks Linds and thanks Emily! I’m glad you enjoyed it! Meditation can do so much for us. Awesome post! Thank y’all so much! Thank you Emily. I’ve found that meditating really relaxes me and it’s something I enjoy doing. It can help so much in our day to day lives! This post has come at the perfect time! I have started looking into how to meditate and found it quite overwhelming – but you break it down into simple, easy steps that I know I can fit into my routine! These are great tips! Definitely going to share on my coaching page 🙂 I like to use guided meditation podcasts, like Meditation Oasis. My stress levels go waaaaay down and clarity of mind goes up when I’m consistent with it. I would love to be able to create a daily routine one day! Great tips! Meditation is a must for me to find clarity in my mind, connect better to my body, and bring peace to the rest of my life & day. My favorite lately are Kundalini meditations. Great post Emily! I love using walks as a time for meditation. My daughter is usually pretty content in her stroller, so it’s a quiet, peaceful time (unless the dog is along, haha). I’m going to show this post to my husband – he used to mediate daily and has gotten out of the habit. I know he’d like to get started again! such great tips for a beginner! Love the train idea. I can really use that! 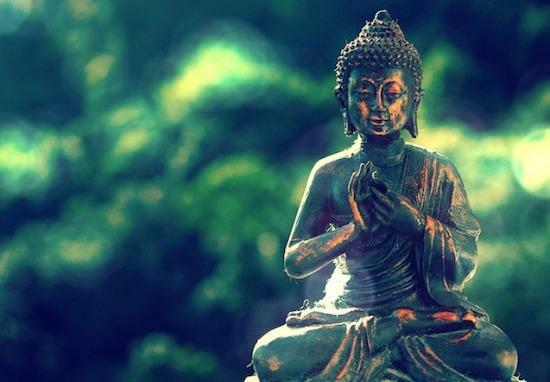 I’m just starting to get into meditation, so this post couldn’t have come at a better time! I love this post! Meditation used to be really easy for me and has recently become more difficult for me to concentrate- because of mind clutter. I am kinda glad for it because now I can relate to those who say they can’t ‘concentrate’ long enough to meditate. Beginning guidelines, like these, are a huge help. Very cool! I love finding other like-minded RD’s. Thanks for sharing! I’ve always enjoyed meditation though I don’t always do it. For now, I’d love to add a walking meditation to my daily routine.